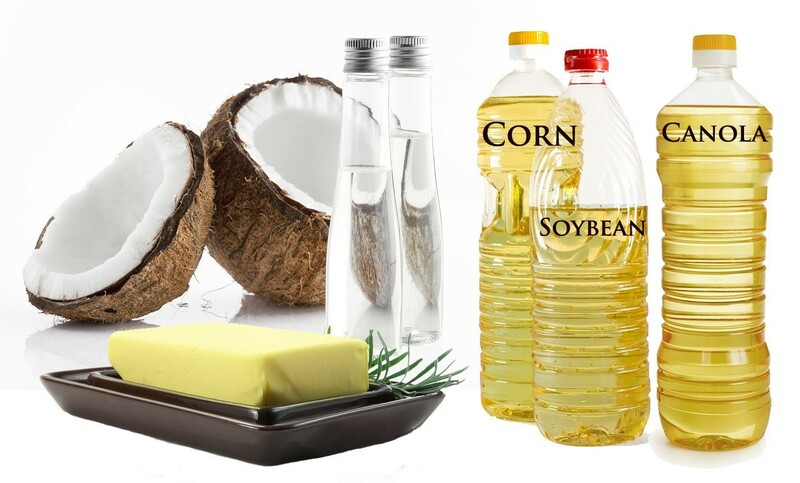 Traditional fats such as coconut oil and butter are high in saturated fats. Modern processed cooking oil such as corn and soybean oil, the new vegetable oils that are polyunsaturated, have only been in the food chain since World War II, and contain dangerous trans fatty acids. However, “fat” is a very general term and does not distinguish between traditional healthy fats and unhealthy modern processed fats and oils. The common belief is that saturated fat is the culprit in fatty liver disease, but a new study published in the July 4, 2017 European Journal of Nutrition comes to a different conclusion. This peer reviewed study, “Chronic consumption of fructose in combination with trans fatty acids but not with saturated fatty acids induces nonalcoholic steatohepatitis with fibrosis in rats,” examined more closely the effects of trans fatty acids (from vegetable oils derived from corn and soybeans) versus saturated fats, found in traditional fats such as butter, coconut oil, and palm oil. Nonalcoholic steatohepatitis is basically advanced NAFLD. It has its own acronym, NASH. The word steatohepatitis combines steato, Greek for fat, and hepatitis, liver inflammation. The fat accumulation led to liver inflammation with NASH worsening one’s liver health and leading to cirrhosis of the liver and potential death. The study’s title gives away their conclusion: fructose is bad for the liver, but it is worse with trans fats than it is with saturated fats. The study’s purpose was based on the premise that fats and fructose predominate in the Western diet do create NAFLD. The researchers’ concern was what type of fatty acids would worsen the condition of NAFLD to NASH. This was an animal study using male Sprague–Dawley rats divided into six feeding groups over time. Each group was fed a different type of fat combined with what they called high fructose, which can be assumed to be high fructose corn syrup or HFCS. A starchy food with peanut oil. Fructose with palmolein, a type of palm oil that is almost half saturated fat and unsaturated fat without transfatty acid (TFA). Fructose with clarified butter, not certain if it was clarified to the point of ghee or not. Either way it is melted butter with fat solids removed. Fructose–coconut oil, an easily digested highly saturated fat. Fructose–partially hydrogenated vegetable oil, the source of trans-fatty acids. In other words, consuming trans-fatty partially hydrogenated vegetable oils (corn, soybean) that are heat processed is much worse for your liver than saturated fats (butter, coconut oil, palm oil). This makes total sense, given the fact that polyunsaturated oils are prone to oxidation and free radical damage, whereas saturated fats are not. The rising obesity and NAFLD epidemic actually began with the rise of processed foods and soda consumption. All the while, high fructose corn syrup (HFCS) was replacing refined cane or beet sugar as a cheaper more effective sweetener while sugar cravings in the Western world increased exponentially. HFCS was also increasingly used as a sweetener for pastries, candies, and even foods that are not tempting to the sweet tooth. But sodas generally contained more HFCS than most other processed food, and sodas were being sold everywhere in increasingly larger serving amounts. HFCS is not to be confused with naturally occuring fructose in fruit. High fructose corn syrup is a highly condensed artificially contrived sweetener from corn syrup. Aside from the obviously damaging factors of GMO corn sources and the byproduct of mercury involved with processing this stuff, HFCS presents metabolic problems with the liver. The liver can utilize only part of HFCS for energy. The rest gets stored as fat in the liver. So combining saturated fats, especially coconut oil, with free form synthetically produced high fructose and finding it does produce nonalcoholic fatty liver is misleading since the key culprit is HFCS, which alone creates NAFLD over time. The study’s determination that trans-fatty acid fat makes NAFLD worse makes sense because wholesome saturated fats are healthy and protective. Saturated fats are natural and have been part of the food chain for many thousands of years, whereas processed foods, including modern vegetable oils, are a recent development in human nutrition. Trans-fats are harmful because they are difficult to digest, damage cell walls, and cause inflammation. Inflammation is the source of almost all autoimmune diseases and metabolic disorder syndromes leading to obesity, diabetes, and heart disease. Trans-fats also inflame the outer layers of the inner walls of blood vessels, known as the endothelium. This leads to vascular inflammation that causes problems, which cholesterol attempts to patch up and then gets blamed for the final arterial collapse caused by the inflammation. Coconut oil is especially healthy because it is a medium chain fatty triglyceride or MCT based natural plant oil. The liver converts MCTs easily and rapidly to energy as ketones. Fat does not get stored in the liver. Trans-fatty acid oils and margarine are ubiquitous in processed food and fast food restaurants, along with some not-so-fast restaurants. They should be avoided, which has been made easier with the requirement to label them as such on the ingredient labels. All liquid vegetable oils that are not cold pressed with partially hydrogenated on their labels are very problematic. Used cold pressed virgin olive oils instead. Margarine is almost totally hydrogenated. You’re better off with butter of almost any caliber, but organic butter from pasture raised cows is best. Simply avoid processed foods as much as possible. Read labels closely even if you do purchase processed foods sold in health food stores. High fructose corn syrup is hidden by using the term corn syrup in the ingredients label. If you see partially hydrogenated oils in the ingredients, put it back on the shelf. Mainstream medicine marginalizes nutritional solutions to existing medical conditions. It considers liver damage irreparable. But the right combination of nutrition and supplements has been clinically proven to reverse even cirrhosis of the liver among patients scheduled for liver transplants. American physician Dr. Burton Berkson had conducted clinical trials on terminal liver patients in Las Cruces, NM a few decades ago. He used high potency alpha lipoic acid, selenium, and silymarin extracted from milk thistle herbs with a supporting foundation of vitamins C and B. The dramatic results of his work were not published in the American medical journals, but the German medical journal Medizinische Klinik did publish his work and it has been transcribed into English here. So the solutions for both avoiding and reversing non-alcoholic fatty liver and its subsequent consequences of other metabolic diseases is in your hands. Research more and ignore the so-called “science” from the pharma-sponsored “mainstream” corporate media who have circled the wagons to protect the pharmaceutical and processed food industries. Tagged coconut oil, fat, fatty liver. Bookmark the permalink.